Ajwain, also sometimes called Bishop's weed, is a plant grown in India and the Middle East and used as an herbal medicine to help treat a number of health conditions, including gastrointestinal issues such as diarrhea and flatulence. It also acts as an antioxidant. 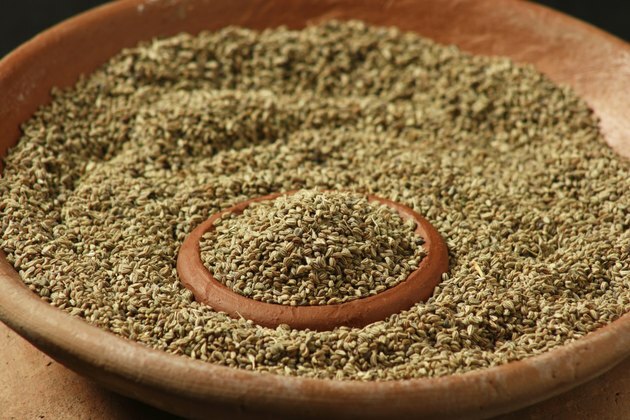 Ajwain hasn't been shown to be effective for weight loss, however, and shouldn't be used without first discussing it with your doctor. Ajwain may not be the best choice for people trying to lose weight. One of its uses in traditional medicine in India is to help treat loss of appetite. It helps speed up digestion, potentially making it so you get hungry more quickly after eating. This is the last thing you want if you're trying to lose weight, as many people already have trouble limiting their caloric intake enough to achieve weight loss at the rate they would prefer. An animal study published in Toxicology Mechanisms and Methods in 2014 did find that thymol, one of the active ingredients in ajwain, may help to limit weight gain in mice fed a high-fat diet. Further research is necessary to determine whether this same effect occurs in people and whether there is enough thymol present in a safe dose of ajwain to be effective for limiting weight gain. Ajwain seeds can have a laxative effect, according to a review article published in Pharmacognosy Review in 2012, and the roots have a diuretic effect. This may be why people sometimes recommend this supplement for weight-loss purposes. Using laxatives or diuretics isn't an effective weight-loss solution, as most of what is lost is just water weight and not fat. Once you go back to eating and drinking normally, the weight will come back. Check with your doctor before taking ajwain supplements to make sure they would be safe for you. Using laxatives could cause adverse effects, including damage to your intestines, dehydration or dependency on laxatives. Ajwain may cause irregular heartbeat or low blood pressure, and high amounts are toxic. It may also have an effect on blood clotting, so people on with clotting disorders or those on blood thinners should avoid ajwain. In addition, pregnant women should steer clear of ajwain, as it has the potential to cause an abortion. The best way to lose weight is to exercise more and eat less. If you find it hard to cut calories, try eating more of foods high in protein and fiber, which tend to be particularly filling. At the same time, consume fewer highly processed foods and foods high in sugars and fats, which provide lots of calories without containing many essential nutrients. Foods that have a high water content, such as many fruits and vegetables and broth-based soups, can also be very filling and make it easier to stick with your calorie goals while trying to lose weight. Although it is possible to lose weight without exercising, a combination of cardio exercise and weight training will improve your weight-loss results and minimize muscle loss. Aim for an hour of cardio at least five days per week, as the minimum recommended exercise of about 30 minutes per day isn't always enough for weight loss. Also include two strength-training sessions per week for the most weight-loss benefits.